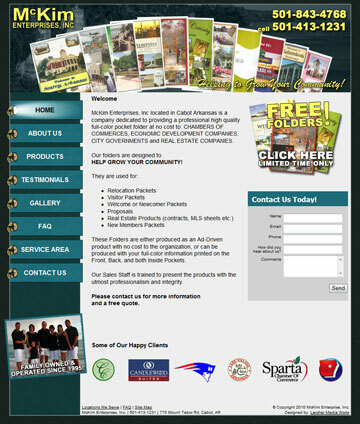 Built as a portfolio website and a lead generation source, this website has impressed McKim�s clients and helped to give creditability to his unique product. This site features a unique vertical navigation that shows a lighted spot light to show which page the user is visiting. The custom flash header shows off the great looking colorfully high-quality folder covers. "Greg and Lercher Media Works have been a pleasure to work with. I met with Greg back in November and he had our site up and going the first of January. We were extremely pleased with his flexability and willingness to make sure we had what we wanted. The logos and graphics he created, are awesome. I will recommend Lercher for anyone that is looking for a high-class web site design."